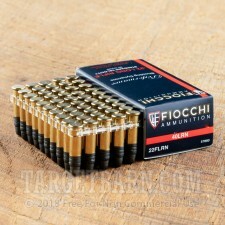 Grab a bunch of these 50-round boxes of Fiocchi .22 Long Rifle ammo for your next target shooting session! 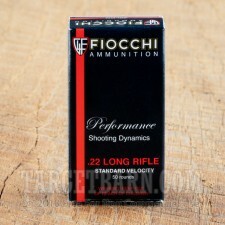 This inexpensive but dependable .22 LR ammunition is a "standard velocity," or subsonic, load. 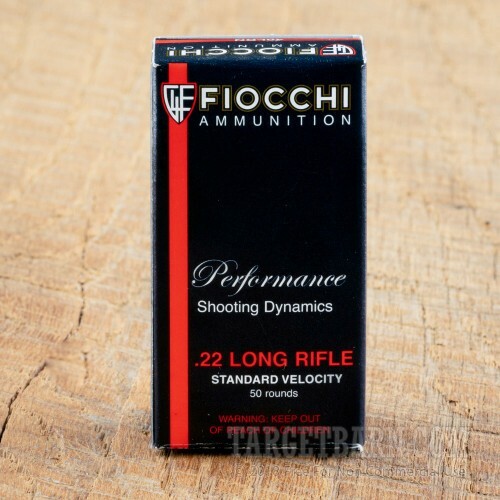 This results in excellent inherent accuracy and optimal noise reduction when fired through a suppressor, as the bullet stays subsonic and does not produce a boom or crack as it crosses the sound barrier. 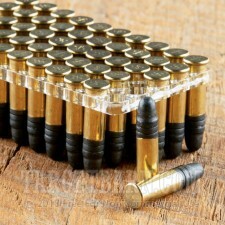 Each cartridge in this box propels a medium weight, 40-grain lead round nose (LRN) bullet at a muzzle velocity of 1,070 feet per second. Established in the 19th century, Fiocchi is an Italian manufacturer with production operations in both Lecco, Italy and Ozark, Missouri. Their products use non-corrosive priming mixtures and brass rimfire casings. 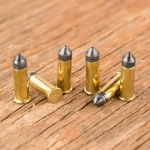 Browse TargetBarn.com's selection of dependable, affordable targets and ammo and stock up for your next few shooting trips!